one drummer Orc with Drum set. 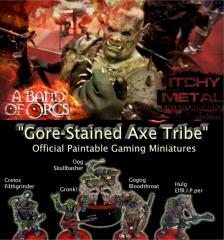 6 great figures to represent the heavy metal band A Band of Orcs. These figures would look great in almost any fantasy wargaming or fantasy football sideline setting. All figures are cast in lead free White Metal and due to their size and often sharp points should be kept away from small children.